Protect Your Family's Health with Air That's Fresh, Clean & Pure by Replacing Your Sun-Pure SP-20, SP-20C or Trio-1000P Air Purifier Filters & UV Bulb Kit on a Yearly Basis. Here You Can Buy the Complete Replacement HEPA and Carbon Filter Kit with UV Lamp, at a Discount Price with Free Shipping! The Trio Portable includes multi-stage filtration and PRO-Cell™ Technology odor and VOC reduction. The Trio Portable is ideal for homes and offices without forced air ductwork or for extra protection in any room. Bacteria, viruses, mold, and fungi are neutralized or inactivated by a high output UVC germicidal lamp with 150 times the UV intensity of the sun. The patented PRO-Cell™ grid magnifies the power of the UV lamp making the Trio Portable one of the most powerful air purifiers on the market. Fresh air exits the Trio Portable, after it passes through 722 square inches of Titanium infused PRO-Cell™. 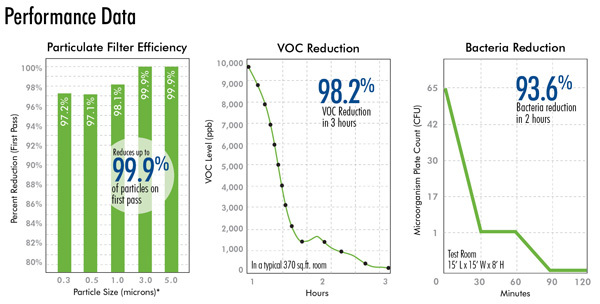 The patented PRO-Cell™ Technology transforms odors, smoke, and volatile organic compounds (VOCs) into fresh healthy air.